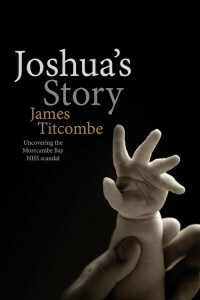 Based on the testimony of James Titcombe, Joshua’s father and a National Advisor on Safety for the Care Quality Commission, the film documents the experience of the Titcombe family during Joshua’s tragically short life. It also outlines their subsequent fight for proper investigation into Joshua’s care, and the failure of the governance and regulatory systems to learn from error. In partnership with Anderson Wallace Publishing, we are pleased to announce the forthcoming publication of this important new book written by Joshua’s father James Titcombe. Officially launched on 2nd December, Joshua’s Story can be pre-ordered here, for delivery week commencing 26th November 2015. Joshua’s Story can be viewed here for the purposes of preview and personal learning at no direct cost to the end user. This online film version cannot be viewed more widely without an appropriate licence. Please respect our copyright; we can only afford to make these resources available and run this website if people do. A powerful and incredibly moving film.It is shocking and saddening that, at the same time as having to grieve for the loss of their beautiful baby boy, the Titcombe family had to fight all the way to get answers. Another exceptional film: poignant, beautifully captured and so eloquently told. A very valuable film as well, I just hope those who need to view it and learn do so. My absolute respect and sympathy go out to the entire Titcombe family. Electronic record keeping is not the answer. It is not reliable, takes more time than paper to the detriment of patient care but has been adopted universally as some make huge profits. Not all doctors and nurses are geeks. The tragedy is that cover-up remains the norm in the NHS (and probably other government organisations) and this culture starts at the top as documented by Julie Bailey in “From Ward to Whitehall” about the disaster at Mid-Staffs. Health care should be organised locally as in Sweden and other countries. The NHS management should be abandoned and replaced with open local administration. Every time I hear “lessons have been learned” I shudder as I know that this is a lie. No bereaved person should have to fight for duty of candour. Openness and transparency should be mandatory and victimising of whistleblowers in healthcare must be criminalised to protect the vulnerable public. I have heard James speak about his harrowing experience on a number of occasions but watching this film still evokes such a strong reaction – very humbled by his courage and resilience to expose the truth. Thanks so much for sharing. A poignant and tragic story – and I thank Joshua’s parents for sharing it. We have so much to learn. But no, I don’t think that the electronic record keeping is itself the answer. For example, the hospital I worked at (and resigned from last year) introduced an electronic Incident Report form. The form was so clunky, and time consuming to use, that a lot of incidents went unreported. A pharmacist said to me “You have to ask yourself whether you have the 20 minutes it takes to complete the form, and whether the incident warrants that time” – important in time-poor staff in an understaffed hospital. But hey, the form works! There are fewer incidents being reported! That must be a good thing! I found that the main barrier to learning from incidents was the hiding of these incidents: disbanding of a group that looked at drug errors as Executive thought that this was better handled by a group that did not contain any doctors or pharmacists, closed ‘Root cause analysis’ being done by people with no knowledge in human factors studies, and only the recommendations being released, anger and blocking by Executive when safety issues were raised. Electronics does not fix a pathological culture. Such a sad story but one that needed to be shared. I work as an Obstetric Registrar and the whole time i am at work I am striving for the best for both mother and baby and I feel those around me are doing the same. But… things can improve and this requires change. A change of culture so that ALL adverse events are reported, made public, scrutinised and acted upon. This is the only way we are going to learn. There still needs to be a bigger shift from the blame culture to a culture where system flaws are analysed and then changes made to make childbirth safer.